From Jenn for the KAC Ladies…. There’s been a fair few ladies out and about at some recent events which is great to see…Angela Davies trudged through the mud at Cartmel Sticky Toffee trail race, Cat Evans (1st) Jo Gillyon (2nd) and Lindsay Walker (hard as nails) raced in the Borders, Marie Nunes conquered ‘the hill’ at Lorton 10k and 6 amazing bods made it to Edale in Derbyshire and finished 3rd ladies team in the first English Fell Champs counter, to name a few! 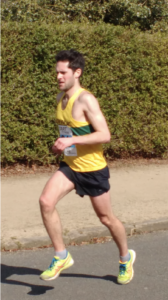 Saturday saw a 12 strong men’s team head down to Birkenhead Park on the Wirral for the Northern 12 Stage Road Relay Championships. 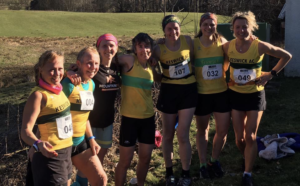 Featuring four ‘long legs’ of 8.5K and eight ‘short legs’ of 4.5K, the event always attracts the cream of running talent as the best clubs in the region battle it out for the best part of 4 hours. With the strongest team for many years, the boys in yellow were hopeful of beating their previous best of 18th place. Alas, it was not to be, but the team battled through with remarkable consistency from 22nd after leg 1 to 19th at the finish. Perhaps if the star quartet of Sam Stead, Chris Edis, Phil Winskill and Simon Netherway not been racing the day before, things may have been different? More on that later. Not to be outdone, Craig Marsh came third in the High Terrain Events Buttermere 10 Trail Race in an excellent PB for the course.